Above: featured markets top-to-bottom are USD/JPY H4, EUR/USD M5, GBP/USD M1, EUR/USD 2-pip Renko. Powered by our fifteenth generation auto-adaptive algorithmic framework, MarketScalper PRO 2017 Edition is one of the most advanced, accurate, and profitable scalping tools on the market. Specifically developed to identify and trade turning-points, swings, thrusts, and retracements. All alerts and signals (including arrows) issued by MarketScalper never repaint, as they are confirmed by the program beforehand. What you see on screenshots is representative of actual, live indicator performance. Simple to use: drop it onto a chart, select a risk appetite, and receive signals/alerts. Single input called Probability gives user complete control over MarketScalper PRO, qualifying signals based on their risk appetite. Risk Gauge - a powerful market monitor - gives user the ability to revalidate each signal. The gauge indicates optimal scalping conditions, when detected. Trade any market (FOREX, futures, CFDs, stocks, indices, etc.) at any time frame and on any chart type - MarketScalper PRO's algortihmic framework automatically adapts. Automatically trade all MarketScalper signals using the MarketScalper EA add-on. Customize auto-executed orders by managing Take Profit, Stop Loss, Slippage, Lot Size, and Pyramiding options - all built right into the MarketScalper EA. Manually trade anytime by receiving audio, visual (arrow), pop-up, push-to-phone, and email alerts every time your strategy conditions are met. MarketScalper PRO's Push-to-Phone Notifications allow you to forward all signals to your smartphone in real-time. Supported platforms: iOS (iPhone, iPad) and Android (4.0 or higher). Fully customize the appearance of arrow signals to blend with any template: choose from 9 different types, and hundreds of colors. Assign specific sounds to long (buy) and short (sell) signals - 13 audio options to choose from. Have a peace of mind - MarketScalper PRO, like all our other indicators, has been thoroughly tested for profitability. It passed all benchmarks, performing particularly well with lower time frames (1-60min) and fixed bar charts (Range, Renko). Get a lifetime upgrade license with each purchase of MarketScalper PRO version 12 (or higher), including all future enhancements and features. The scalping algorithm is frequently optimized and improved as new market behavior emerges. Pair MarketScalper PRO with TrendSuite institutional to create a complete trading system, using first add-on to enter as trend gains strength and second to exit as soon as momentum exhausts/trend retraces. Discuss and exchange strategies with our chief algorithm architect, Marko Nikolic, and other MarketScalper PRO users via MarketScalper Community Forum (complimentary premium membership included with purchase). Unlimited technical support including live remote assistance. FOREX and most other markets range approximately 80% of the time. Statistically speaking, that is a very large figure, and one definitely worth capitalizing on. That statistic is what gave Marko Nikolic the idea to create a highly specialized indicator that takes advantage of those bountiful market opportunities. We're not selling a robot or an automated trading system as we firmly believe that each trading strategy is as unique as the trader who uses it. Nor are we going to promise or guarantee any unrealistic returns. What we are offering, however, is a very effective trading tool that caters to your risk by seeking out qualified ranging, swinging, and retracing market behavior. Unlike previous versions of MarketScalper PRO, version 10 comes programmed with a single user input - Probability. This parameter, although seemingly simple, in fact controls a complex set of algorithms that cater to user risk preferences. As suggestive by its name, Probability qualifies signals from least probable (value of 1, representing a minimum target success rate of 70%) to most probable (value of 10, representing 88% and higher). MarketScalper PRO 2017 features an all-new algorithmic framework. It is auto-adaptive, requiring just the user's risk appetite - all other calculations are automatically handled by the internal set of algorithms. The algorithms are quantitative and diverse in nature, considering multiple angles applicable to scalping, including price behavior, momentum derivatives, and extensive statistics before issuing signals. The High Frequency Mode (HFT) applies a completely separate algorithmic framework from the one used in non-HFT mode (Probability 1-10). The HFT algorithm is designed to track immediate momentum exhaustion in regards to broader investor interest, capitalizing on divergences between them. In other words, it looks for unsubstantiated (or unsustainable) price movement on a level more microscopic than strictly trend exhaustion. As result, MarketScalper PRO in HFT mode will issue an abundance of signals - many of them accurate within 1-3 bars of forecasted signal direction, but they require rapid action on trader's part. Binary Options with expirations set to 2-5 bars following the issued signal. Swing Trading, by using HFT signals to close already open positions. For example, following an aggressive trend-geared indicator to enter a market (as price gains momentum), and HFT mode to exit, as soon as momentum exhausts and price action is on cusp of swinging in the opposite direction. We took your feedback regarding older versions of MarketScalper PRO's dashboard (GUI) and rebuilt it to scratch. The redesigned dashboard is simple, fast, and only displays the essential information a scalper needs to know - namely, your Probability setting, inherent (background) market risk, succinct commentary (no metrics to decipher! ), and icons representing your selected alert options. You can place the new dashboard in any of the 4 chart corners. MarketScalper PRO's algorithmic engine (RAZOR), aside from being auto-adaptive, was also developed to be highly expandable. Algorithmic updates are published on quarterly basis, containing the latest behavioral market definitions and rules for the indicator to take advantage of. This process ensures that indicator performance remains optimal and at forefront of our algorithmic research. When MarketScalper PRO is attached to a chart, a message in the bottom-left will display the definition ruleset (Build) that the indicator is presently parsing. This text can be turned on or off. Email, pop-up, and push-to-phone alerts are now more readable, and include a PRICE LEVEL at which signal was issued. This was a widely requested feature by numerous clients. Audio alerts now also include options to assign a specific sound to each, Long (Buy) and Short (Sell) signal. There are 13 sound samples to choose from, including voice-overs announcing "Buy" and "Sell" conditions (both of which are defaults for their respective signals). MarketScalper PRO has always featured the CountBars parameter, whose purpose is to let you specify and limit the number of bars considered in calculations. MarketScalper PRO now incorporates a visual component to this feature - a labelled vertical line that shows exactly how far back the calculations go. 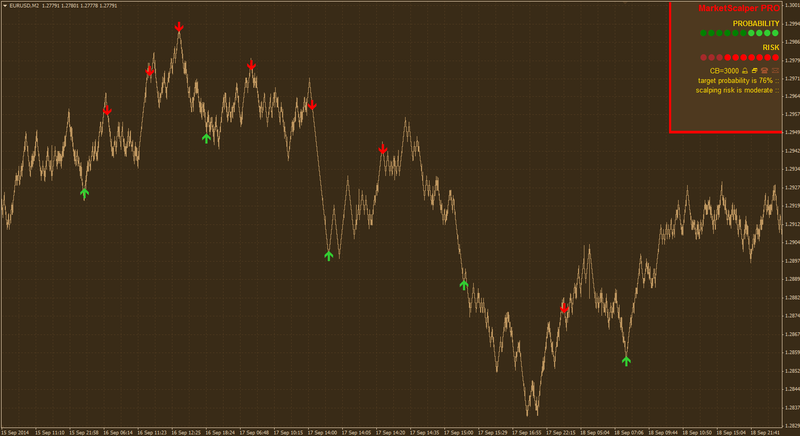 Furthermore, MarketScalper PRO is also fully compatible with all non-time frame charts such as Range, Renko, etc. A much requested feature has always been the inclusion of higher time frame compatibility. That request is now reality, courtesy of the new engine that features rules especially written for higher time frames. MarketScalper PRO still performs best in H1 and lower due to their mostly ranging behavior, but it is now also capable of effectively detecting higher time frame turning points (see EUR/JPY H4 example below). Futures markets, primarily commodities, are highly reactive to most economic, political, and corporate fundamentals (news, reports). It is precisely this volatility that makes MarketScalper PRO exceptionally compatible with Gold and other commodity markets. Extensive multiple time frame back and forward-testing has yielded positive returns. MarketScalper PRO (including Mixer) takes a minute to install and its operation is as simple as drag-and-drop.. Installing and updating the indicator: MarketScalper includes an installation wizard, which automatically installs the MarketScalper PRO and Mixer indicator package in seconds. The same wizard also serves as an auto-updater for future upgrades. You no longer have to worry about which file goes where - just double-click and let the installer do the rest. Start Metatrader 4, add MarketScalper PRO to a chart, and input your desired risk via Probability parameter (1-10). Once a turning point is detected, MarketScalper PRO will issue a signal via arrow, audio, pop-up, and/or push-to-phone alert. All alerts are issued on confirmation - above a new bar once the prior period closes. MarketScalper PRO never repaints. You may additionally set up Push-to-Phone Notifications and Email alerts. The first option forwards all MarketScalper signals to your smartphone (iOS and Android) in real-time, while second delivers all signals right to your inbox. Push-to-Phone Notifications is a feature found in all Mnikolic Investment Technologies software. Push notifications allow you to trade signals generated by the desktop version of Metatrader 4 (onto which MarketScalper is installed) without having to physically be next to the computer. Think of your desktop as a signal server, and your smartphone as a signal recipient. Once you set up MarketScalper on the desktop, you can run it 24 hours and execute signals as they are sent to your phone – Metatrader 4 mobile hooks to your broker for order execution. If you have concerns about your internet connection, may optionally install MarketScalper on a Windows VPS server. We offer such service through our ChartVPS subsidiary, but there are many other VPS providers out there. Just make sure the VPS hardware is adequate (CPU, RAM) and that redundancy connections are in place (99.5% or higher uptime recommended). (optional) Use multiple instances of MarketScalper PRO, each with different Probability values, if your trading strategy demands it. For example, you could use high value (higher probability of success) to open trades, and low value (higher frequency of signals) to close, as soon as market loses steam. Add multiple instances of MarketScalper to the same chart, each with different Probability setting. For example, you could configure 2 instances, one with conservative settings (high probability) and the other with aggressive (low probability). You would then take advantage of signal confluence, opening positions when both instances are showing the same directional signal (within few bars). Looking For Complete Strategy Customization? MarketScalper PRO is ideal for traders who want reliable signals without tinkering too much with too many indicator settings. On the other hand, those of you looking for the ultimate in customization and manual system building may be interested in TradeBuilder - Classic Edition. It features 31 powerful integrated indicators (Market Bias Monitor, Double Moving Average, Triple Moving Average + Short/Long Modes, Price-MA Cross, Hull Moving Average, Ichimoku Kinko Hyo, Envelopes, Bollinger Bands, Volume, Moving Average Convergence Divergence (including MACD-Signal Cross and MACD-Distance Filter), Oscillator of Moving Average, Parabolic SAR, Heiken Ashi, Heiken Ashi Smoothed, Relative Strength Index, On Balance Volume, Relative Vigor Index, Money Flow Index, Commodity Channel Index, Stochastic Oscillator, Momentum, Average Directional Movement Index, Average True Range, Accelerator/Decelerator, Force Index, Alligator, Gator Oscillator, Williams' Percent Range, Demarker Technical Indicator, Market Outlook Filter) as well as 106mn+ options for crafting hundreds of complex, one-of-a-kind strategies. Disclaimer: MarketScalper PRO is a trading platform plug-in/indicator intended for analysis of markets. Its effectiveness is based on your input and experience, and as such, Mnikolic Investment Technologies (formerly Build-A-Signal Software) and Marko Nikolic are not responsible for any losses you may incur as result of using MarketScalper PRO in your trading endeavors. See full disclaimer.